I have been nominated by my blogging friend, Mark Bialczak, to participate in the Five Photo Five Series Challenge (I am sorry I am a day late on the second installment of this challenge, but life got in the way yesterday). Our family travelled by ship when I was a child. It seemed to be the way to travel when families were immigrating to other countries. When we left Australia, on our way to America, we sailed from Sydney to San Francisco. It took three weeks. We saw flying fish and dolphins swim with the ship, attended costume balls and ate unlimited petit fours (at least that is what I remember). Several years later, I was sent to live with my Grandparents on the Isle of Wight. Here my Grandmother made me memorize Tennyson and Wordsworth (old-school homeschooling), I drank a ton of tea, ate a huge amount of watercress and cheese finger sandwiches, puttered in the garden with my grandmother and I was not allowed to sniff (one must never sniff, please use the handkerchief provided to blow your nose). During this time my Grandparents and I returned to Australia in order to enroll me into the boarding school I had previously attended in New South Wales. To get there, we travelled by ship from Southampton to Sydney, this trip took a mere two weeks. My favorite part of ship travel, was leaving the port. 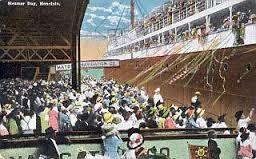 Back then, we threw streamers from the deck of the ship to those below, the people who were waiting to see their family members and loved ones off. The streamers came tightly rolled in packs and we would fling them as far as we could, holding onto one end and hoping the other end was be caught by the waiting loved ones. Brilliant colors, strings of streamers shot down to the people standing below. The ship horns bellowed so loud, I recalled the sound rumbling in my tummy, and as we pulled away the streamers became taut and broke. Yellows, reds, pinks, blues and green ribbons twisting in the wind, so beautiful and cheery as they fluttered down but so sad as they snapped apart with tension and what remained, hung limply in the hands of those holding the streamers. I am not sure ships are allowed to do this now, when they leave port, unless they have biodegradable streamers. We didn’t seem to worry about stuff like that, when I was a kid. For several long and arduous days we sailed through rough waters on this particular trip to Australia, where the tumultuous sea waters reflected the green tint of the sky. We saw nothing of land, but this little strange rocky outpost covered in penguins. Only my Grandfather and I saw this rock with the penguins, because the rest of the travelers were in their beds suffering from seasickness. Several years later, I read The Rime of the Ancient Mariner, and recalled how crazy the green tint and the desolation of being surrounded by water made me feel (at least we had water to drink and our tongues didn’t wither). As we crossed the equator things seemed to brighten up. The sun came out, the sea became a sapphire blue once again, and the flying fish raced happily in front of the ship. The people appeared from their cabins, with only a minimal green tint to their skin. One of the traditions of sailing is to celebrate the crossing of the Equator. 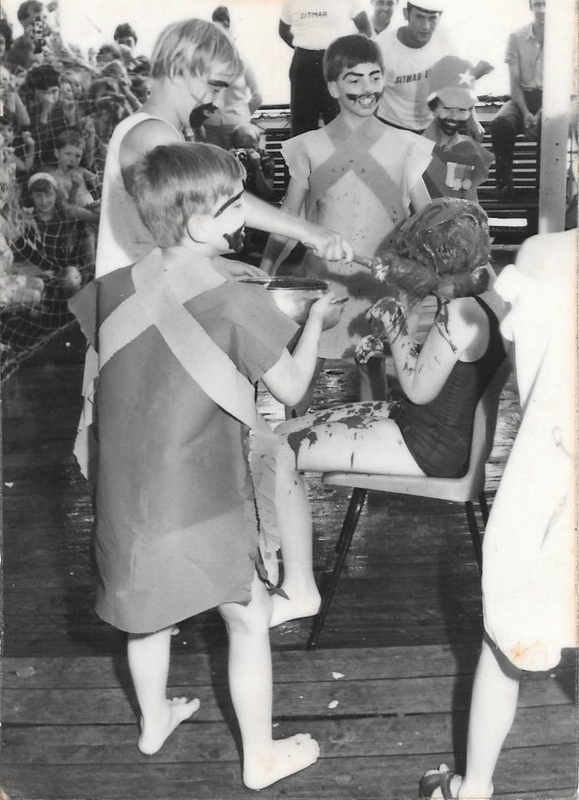 With this celebration, members of the sailing party are dressed up to portray King Neptune’s court and transgressors must appear before the court to have their ‘punishment’ doled out to them. I am not sure what my transgression was, but the caption written on the back of this photo by my Grandmother reads “June ’71 on “Fairsky” – Taking her punishment – to be coated with chocolate pudding and thrown into the pool.” I do remember the sloshing, cool, slimy feel of the chocolate pudding, even now, 44 years later. I can still see that huge bowl of pudding. When I think back on all of this now, it seems like such a different time, an era long past. I can’t imagine what parents of today would do if their child was subjected to chocolate pudding being slathered on them, and being chucked into the pool. I am sure they would voice their concerns about the harming of their child’s self-esteem and the possible ramifications of this type of behavior leading to post-traumatic stress disorder. But we didn’t think about any of that then, and we sure didn’t talk about stuff like that. Travelling by ship, sailing traditions and all the other things we did were just part of that time, nothing more and nothing less. I spend a great deal of time these days wishing I had soaked all of those occasions and events and ways of doing things in, really appreciated them for what they were, taking pictures in my mind, because I really miss those days. Life was so incredibly interesting back when I was a child. Here’s how this challenge works: You post a photo each day for five consecutive days and attach a story to the photo. It can be fiction or non-fiction, a poem or a short paragraph that shares your insight or inspiration of or from the image. I am supposed to nominate someone to participate, but I know it is the weekend, and people have things to do. If someone would like to take part in this challenge, I will extend a nomination to them. You had such an interesting childhood. Ships, sailing across the ocean, different continents. Wow! Your writing is so engaging and I love reading your posts. Have a great day. Thank-you so much!! I never realized how different my childhood was until I settled down in the place I am now, 9 years ago, and realized some people live in the same place their entire lives. That was a really weird concept to me. Oh this sounds like such a great memory. I enjoyed this post a lot! Thank-you!!!!!! No, we no longer travel by ship and after writing this post and really dredging that memory up, it makes me want to at least take a cruise. Philadelphia to Paris sounds wonderful. Are you in Paris now? That is one of my most favorite cities, that and Venice. Yeah I have been living in Paris (inside the city, which I didn’t do when I lived with my parents as a teen) for the last 2 years and almost 4 months. Thank-you, Helen. Seems like so much excitement has been deleted from our lives because of the naysayers. It really is a shame! You know, I think most of us didn’t think about the adventure of life when we were young. We take advantage of things not realizing how important they really are. Now, I try to remind myself to enjoy each experience, even when it’s not-so-good, because there are good things that usually come out of it. I just fell yesterday and sprained my ankle. I’m laid up now, but even this is an adventure I never experienced before and I’m finding silver linings (like it could’ve been worse, or like my husband’s). Thanks for sharing your moving story. I found it very interesting, as I’ve not traveled much in my life and had no idea about the things you wrote here. Lori, I am so sorry you messed up your ankle. I hope it mends quickly. I hope your husband is waiting on you hand and foot (no pun intended – well, maybe a bit). WHen I was a kid I was always fascinated by kids I had met, who had grown up in the same place, the same house their whole life – that I find really interesting. Get better soon!!!!! Perhaps you are right, because when I tell people the tales of my childhood, they always look at me curiously. I suspect they think I might be making them up. I believe every word, S.D. They say truth is stranger than fiction, correct? You are very right about that, my friend of the blogging world!!! !